When life gives you lemons, go ride Lemonade! 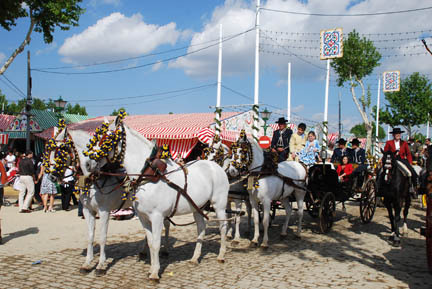 We have tried to attend "La Feria de Abril" for the last two years. In 2006 we had to return home early because of Kathy's breast cancer treatments, and last year because our house burned down. 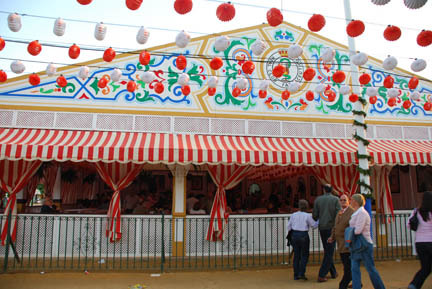 Both events kept us from attending the April Fair in Seville in the last two years. But this year we finally made it!! But first the story of how we got here from St. Malo, France. After a rainy, windy time in Normandy and Brittany, France we decided to head to Portugal and visit friends on the way to Morocco. We first went to St. Malo, an ancient town in Brittany once the home of pirates that raided the English channel, no pay-no passage through. It is another walled medieval town. A couple years ago as we passed through Avila, Spain. It was our first walled city. On this trip we will see three, St. Malo, France; Brangança, Portugal; and Evora, Portugal. These towns never cease to amaze me. They have narrow and uneven cobbled lanes leading between the buildings towards a central plaza or town square. This is where the church and important civic buildings were built several hundred years ago. And today they are still in use! 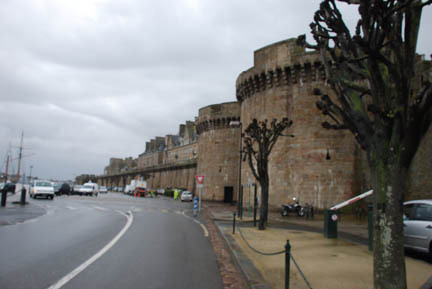 St. Malo was almost completely destroyed in WW II but was rebuilt in the previous style. We are headed south on the fast highway, paying the necessary tolls. We have had enough of the rain and the wind. We make it to Bordeaux the first night and meet our first case of French snobbery. (For our European friends, an explanation. France has a reputation in the US for being snobbish and unkind to persons who do not speak French. Until this time we have not seen it and we have passed through France 3 times in our travels, talking with them, staying with them and being assisted by them.) There is a very cheap hotel chain called Formula 1 throughout France and in some other countries. They publish a booklet listing their locations and for the French hotels it includes a price list of each one's rates. We arrived at the one in the south side of Bordeaux and the front of the building has a banner €32 for a night, but the price list said €30 until the 29th of June. I walked in with the price list in my hand and asked for a room. The lady behind the counter spoke rapidly in French. I said that I did not understand and asked if she spoke English. (We have stayed at many Formula 1's and have never met a clerk who couldn't.) She said in a stern voice "RESERVATION? ", I replied "No" and she spoke again in rapid French saying what I understood to be that they were full and we could just go on our way. They had 64 rooms and the parking lot at 5PM had 8 cars in it. We went across the street and stayed at a competitor of theirs for €39 and got free wireless internet (it costs 4.50/hr at Formula 1). At 10PM the Formula 1 only had 17 cars in the lot. And these hotels are not ones that you walk to! I think she just decided she was not going to argue about the booklet price with a tourist that couldn't even speak minimal French. From Bordeaux we drove to Valladolid, Spain in heavy rain and stayed at another Formula 1. This time with no problems except the Renault factory behind it was noisy. (The Formula 1's are often in industrial areas of a city.) The next morning was blue sky, sunshine and warm weather!!! Our first this year!!! 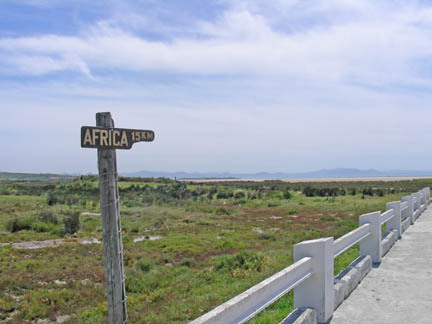 We turned west and headed for Portugal, this time taking some 2-lane roads. That afternoon we arrived at Carlos and Nella's in Famalicão, Portugal. I had called two days earlier and warned them, but Carlos was in Germany and without cell phone coverage and we arrived without warning. It didn't matter, they took us in, Carlos arrived the next day and we had a wonderful visit with them and Tim and Julie from Porto. We stayed four days, much longer than planned and then headed for Évora. In Évora live José and Maria, more good friends. He also owns the Motodiana Honda Shop and we needed some work done before going to Morocco. We had front brake problems and needed an oil change and tune-up. The bike did not want to start on cold and wet mornings (but then neither did I). We had to get help from another bike twice at the Belgium Treffen with our jumper cables to get started (and then we loaned then to a French couple to use too). After the work we stayed another two days because the weather had turned bad again. Finally on Friday the weather was good again and we headed south to the Algarve and visited one night with new friends Constantino (Tino) and Magda. They have been to Morocco many times on their GoldWing and insisted that they lead us through customs. They needed to take some things to some friends in Morocco and decided to go with us rather than go later. 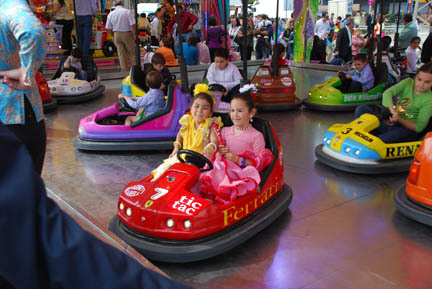 Now it is Saturday the 13th of April, La Feria ends tomorrow. So we agree on a place to meet at the ferry dock and leave for Seville. 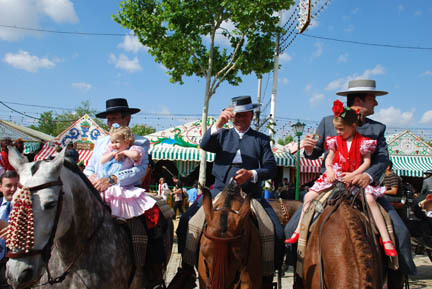 La Feria de Abril is an annual event celebrating the area's dance (Flamenco), wine (Sherry), horses (Andalucía) and bullfights. The fairgrounds consist of hundreds of "casetas" lined along streets. Each caseta is a canvas covered room at least 20' (6m) by 50' (15m) split into two crosswise (many are bigger). The front has tables and the back has the bar and kitchen. Each caseta is owned by a person, group, club, union, association, fraternity, etc. To enter you must belong to, or be a guest of, the owner. Their are a few public casetas that anyone can enter too. The picture is of the Pharmacist's Caseta. (My father and sister are pharmacists.) Inside is where the food and wine are served and the dancing and music is held. I'm told that having a personal family caseta is a status symbol where you can entertain and impress your friends. There was definitely a lot of work and decoration that went into most of the casetas. 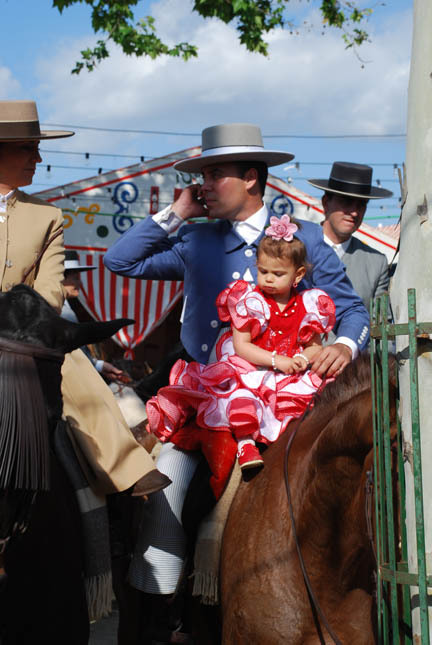 Another important aspect of La Feria is to see and to be seen. For this you have a horse and/or a carriage. And of course, the proper costume and glass of sherry. And don't forget the ever-traditional cell phone! And there is a carnival and circus to go along with the fair. The last day was Sunday and we headed south to Tarifa, Spain to catch the ferry to Morocco on Tuesday with Constantino and Magda. On the beach by our campground was this sign. That's Morocco in the distance.